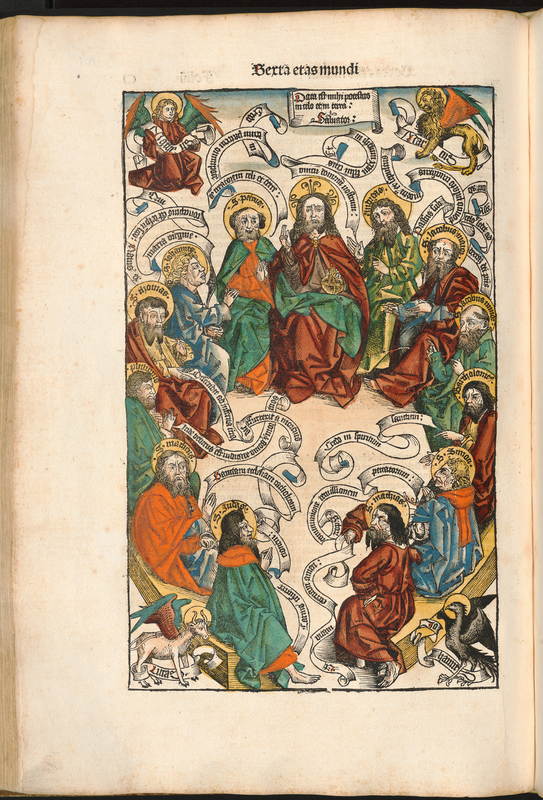 In 1493 a group of Nuremberg citizens published the Liber Chronicarum, a richly illustrated printed book that recounts the history of the world from Creation to what was then present day. The massive tome, which contains an impressive 1,809 woodcut prints from 645 different woodblocks, is also known as the Nuremberg Chronicle. This modern English title, which alludes to the book’s city of production, misleadingly suggests that the volume only records Nuremberg’s history. Even so, I imagine that the men responsible for the book would approve of this alternate title. After all, from folios 99 verso through 101 recto, the carefully constructed visual and textual descriptions of Nuremberg and its inhabitants already unabashedly favor the makers’ hometown. Truthfully, it was common in the final decades of the fifteenth century for citizens’ civic pride and local allegiance to take precedence over their regional or national identification. This sentiment is strongly stated in the city’s description, which directly follows the large Nuremberg print spanning folios 99 verso and 100 recto (fig. 1). The Chronicle specifies that although there was doubt whether Nuremberg was Franconian or Bavarian, “Nurembergers neither wished to be considered Bavarians nor Franconians, but a distinct people.” The text goes on to explain that as a consequence of the city’s poor soil, “its people are industrious craftsmen. All are either ingenious workmen, inventors, and masters of various wonderful and subtle arts and crafts, useful and ornamental, or [they] are enterprising merchants and manufacturers.” Here, it is important to remember that wealthy individuals or groups, such as town councils or guilds, often demonstrated their civic pride by financing communal building projects, including churches, hospitals, and fortifications. Perhaps, then, the proud craftsmen and merchants who collaborated on the Nuremberg Chronicle intended for their publication to function in a manner similar to those architectural undertakings. But instead of funding a structure that would only reach a local Nuremberg audience, the men innovatively promoted and memorialized their beloved city in print—a medium that could easily transmit their message to cities near and far. From the earliest surviving contract between the financial backers, Sebald Schreyer and Sebastian Kammermeister, and the artists, Michael Wolgemut and Wilhelm Pleydenwurff, it seems that the men anticipated the international distribution of their publication. The document, dated to December 29, 1491, alludes to Latin and German translations of the Nuremberg Chronicle. 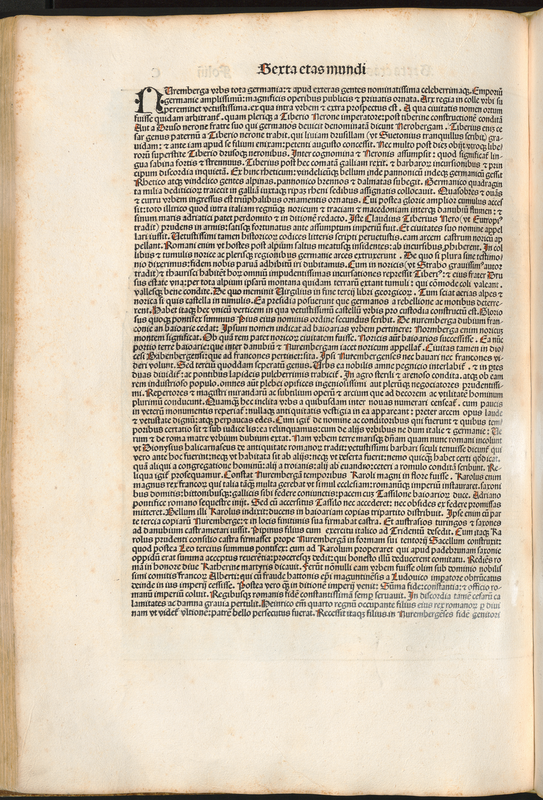 Hartmann Schedel, a Nuremberg humanist and surgeon, was asked to provide the Latin text; Georg Alt, a Nuremberg city official, (by many accounts, poorly) translated the Latin into German. Alt’s vernacular translation likely targeted the local German-speaking market, but because Latin was the language of the educated elite throughout Europe, Schedel’s Liber Chronicarum would have undoubtedly appealed to a broader readership. Anton Koberger, Nuremberg’s leading publisher, printed 1,500 copies of the Latin edition and 1,000 of the German edition. These figures, too, suggest that the investors projected sales abroad. According to the final sales account from June 22, 1509, the Nuremberg Chronicle sold fairly well: only 509 Latin and 49 German copies remained unsold. The same document provides information (albeit limited) about Koberger’s marketing and distribution system: Latin and German copies of the Nuremberg Chronicle made their way to German cities (Augsburg, Eichstätt, Leipzig, Frankfurt, Passau, Munich), French cities (Lyon, Paris), Italian cities (Milan, Florence, Genoa), and the capitals of Hungary (Budapest), Austria (Vienna), and Bohemia (Prague). Knowing that this group of ambitious Nuremberg neighbors aimed to sell 2,500 Nuremberg Chronicles to wealthy, literate audiences throughout Europe, the book’s special treatment of Nuremberg is all the more intriguing, though not unexpected. The Nuremberg cityscape (figs. 2a-b, left), which is deliberately positioned near the beginning of the Sixth Age of the World (the Christian era), fills the memorable opening of folio “C,” the Roman numeral for 100. Unlike the nearly 100 other cityscapes in the volume, Nuremberg does not share its pages with descriptive paragraphs; instead, the only text on its pages are the header and the label “Nuremberg.” The city’s self-congratulatory description and largely fictitious history—claiming Roman origins for a city first documented in the year 1050—appear on the following pages (figs. 3a-b, below). This format ensures that the reader’s attention remains focused on the depiction of the city. The men responsible for the Nuremberg Chronicle created and distributed a specific image of their city—and, by extension—themselves. What message did they wish to convey through the Nuremberg cityscape? As I will demonstrate below, producing an accurate representation of the city’s main architectural features was one of the artists’ goals. But in the foreground of the cityscape on the outside of the fortifying walls, the artists included seemingly superfluous non-architectural elements (e.g., figures, installations near the road, etc.) that are unnecessary for identifying the city. What do those often over-looked details of the cityscape convey about Nuremberg? By identifying and interpreting these elements as an integral part of the overall composition, I will argue that the message sent to local and international audiences via the Nuremberg cityscape was one that projected the city’s pious Christian identity, encouraged trade, and warned against breaking laws in the imperial free city. "The great good fortune of the Ages has dawned upon us, dear reader, whether we think of the universal peace of the world or the education of humankind. For nothing has hitherto appeared that can guarantee scholars and all men of learning greater and deeper pleasure than the New Book of Chronicles with its pictures of famous men and cities, which has just been printed at the expense of rich citizens of Nuremberg. Indeed, I venture to promise you, reader, so great a delight in reading it that you will think that you are not reading a series of stories, but looking at them with your own eyes. For you will see not only portraits of emperors, popes, philosophers, poets, and other famous men, each shown in the proper dress of his time, but also views of the most famous cities and places throughout Europe, as each one rose, prospered, and continued. When you look upon all these histories, deeds, and wise sayings, you will think them alive. Farewell, and do not let this book slip through your hands." The exuberant advertisement, which targets “scholars and all men of learning,” is sure to tell its readers that “rich citizens of Nuremberg” are responsible for this feat of modern intellectualism and technology. 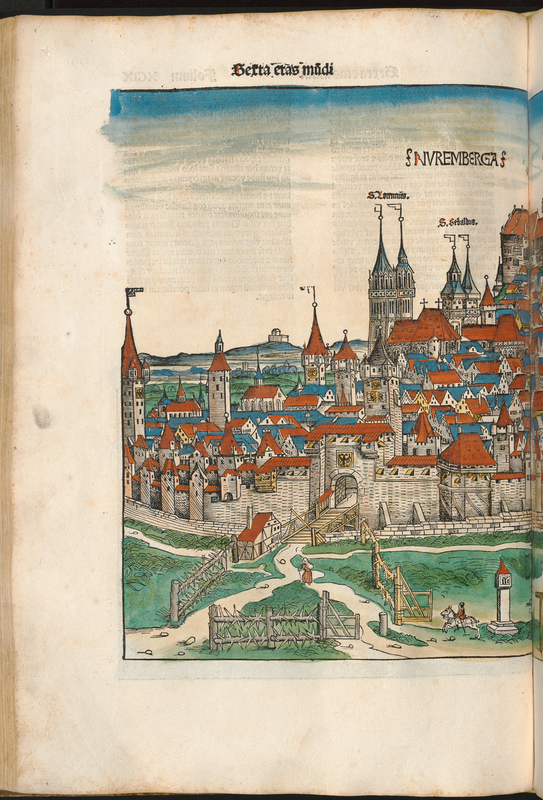 When readers in Germany and abroad looked at the approximately 100 “views of the most famous cities and places throughout Europe” that appear throughout the Nuremberg Chronicle, the local and international “arm-chair travelers” had the benefactors in Nuremberg to thank for their virtual travels—studying those cityscapes was certainly less dangerous and less expensive than actually visiting the faraway cities. Yet the majority of those images feature depictions of generic central European cities. The unspecific cityscapes, interestingly (and quite obviously), were reused multiple times to represent different cities. For example, one woodblock illustrated Troy, Pisa, Toulouse, Tivoli, Ravenna, and, in the Latin edition, England (figs. 6a-f, below). However, thirty-two of the cityscapes are considered “authentic,” meaning that they can be identified by certain recognizable elements, primarily architecture. One of the most recognizable cities in the Nuremberg Chronicle is Rome (fig. 7), a cityscape easily identified by the Coliseum on the left and the Castel Sant’Angelo on the right. In addition to Rome and Nuremberg, the well-to-do owner of a Nuremberg Chronicle could peruse “authentic” views of Augsburg, Bamberg, Basel, Breslau, Budapest, Cologne, Constance, Constantinople, Cracow, Eichstätt, Ensisheim, Erfurt, Florence, Genoa, Heraklion/Crete, Jerusalem, Lübeck, Magdeburg, Munich, Neisse, Passau, Prague, Regensburg, Rhodes, Salzburg, Strasburg, Ulm, Venice, Vienna, and Würzburg. Although this paper exclusively focuses on the Nuremberg cityscape, it is worth noting that nine of the “authentic” views depict cities where Koberger’s agents sold copies of the Chronicle. Imagine how viewers in Augsburg, Florence, or Prague might have reacted to the semi-accurate images of their cities—especially when compared to the much larger, more detailed image of Nuremberg. Of course, one could argue that the Nuremberg image is more “authentic” because Nuremberg artists created it—and that is a valid point, but the Nuremberg cityscape is grander in scale, detail, and placement because the men behind the Chronicle wanted to make a statement about the greatness of their city. All but five of the “authentic” cityscapes are double-page prints—many of which, like Nuremberg, are the earliest printed images of those cities. Unsurprisingly, those twenty-seven prints have drawn the most scholarly attention (figs. 8a-aa, image grid above). For decades art historians working on the Nuremberg Chronicle’s cityscapes have done the important work of identifying buildings, proposing potential source material, and comparing the artist’s depictions of cities to the real things. Like so many before me, I am specifically drawn to the Nuremberg cityscape because of its size, accuracy, and significance to the men responsible for the book. The interpretation that follows is reliant on and in discussion with the most recent analyses of the Nuremberg cityscape published by Jeffrey Chipps Smith and Achim Timmerman. These rich passages pair well with the equally rich representation of Nuremberg. From the very first sentence—and, I would argue, from the first glance at the print, the book insists that Nuremberg is renowned, prosperous, and worth visiting. Both author and artists give the “very old royal castle” a privileged position: placed at the beginning of the text and at the top-center of the page, respectively. Although the artists painstakingly record architectural details, here and in other places, they sacrifice realism in favor of shaping the appearance—and thus, the meaning—of the cityscape. Looking at a photograph of Nuremberg’s castle (figs. 9a-b, right) reveals that the artists exaggerated the “hill” on which the castle sits; the increased elevation adds visual dynamism and displays dominance. Similarly, the artists magnify the “large and elegant church edifices.” Photographs confirm that the artists accurately depicted the gabled spires of St. Lorenz and the steeped rooftops of St. Sebaldus (figs. 10a-c, below). But they did not use realistic perspective to depict the soaring spires; instead, the churches are shown close together and of approximately the same size. This was likely done for visibility; nevertheless, adjusting the size of church buildings and labeling them emphasizes their presence in the city. Highlighting religious buildings—as well as the fact that the city has two parishes, each with their own Gothic church—suggests that Nuremberg is particularly pious and can afford to maintain two congregations. Ultimately, accuracy is less important than ensuring the legibility and desired visual impact of the city. Although the detailed textual description of Nuremberg stops at the city walls, the accompanying cityscape extends well beyond the Frauentor gate (fig. 12). Unlike the massive architectural elements discussed above, the small figures and roadside installations in the foreground are often overlooked in the scholarship. But I propose that these silent details, those without textual identification, are just as crucial to understanding the meaning of the Nuremberg cityscape as the hilltop castle, the enlarged churches, and the tower-strewn fortifications. In order to discern the message transmitted to local and international audiences via the Nuremberg cityscape, I will first identify and interpret its foreground imagery. Three human figures approach Nuremberg in the bottom portion of the print (fig. 13). A woman carrying a bundle on her back and a walking stick in her hand is nearly inside the city. Behind her on the same road is a man riding a horse. He will soon pass through the open wooden gates to enter Nuremberg. The third traveler is a bearded merchant or peddler with a basket on his back and a walking stick. Whether man or woman, merchant or noble, Nuremberg welcomes them with open “arms.” Both the formidable wooden gates and the impregnable Frauentor gate are open for trade, pilgrimage, or political envoys. In fact, the road visibly continues across the wooden bridge through the open entrance. Opposite the Frauentor gate on the far right where the Pegnitz River enters the city are Nuremberg’s mills. Like the figures who signal trade, the mills allude to the city’s industry. The bearded traveler stands near, or perhaps walks by, three wooden crosses at the center of the print: they are life-size replicas of Christ’s cross and the crosses on which two thieves were crucified beside Him on the hill of Golgotha (figs. 14-17, below). The man’s raised hand signifies his emotional response to the roadside installation. The central cross is adorned with the Arma Christi, the weapons used against Christ during the Passion. Here, replicas of the lance that pierced Christ’s side and the rod with the vinegar-soaked sponge offered up to quench His thirst form an X. A simplified approximation of the Crown of Thorns hangs at the center and a rectangular plaque at the very top must have read “INRI,” Jesus of Nazareth, King of the Jews. Club-like objects hang from the two thieves’ crosses, but it is unclear what they represent. It is possible that those are supposed to be the instruments used by the Romans to break the thieves’ limbs. Previous scholars, who had misidentified the wooden structures as gallows, in turn, read the roadside installation as a sign of “the powers of jurisdiction wielded by the city;” however, Jeffrey Chipps Smith, who correctly identified the crosses, argues that that the pious installation likely alludes to the sacred relics housed in the city. In 1423 Holy Roman Emperor Sigismund, appreciative of the city’s continued loyalty, decided that Nuremberg should be the permanent guardian of the holiest relics and the imperial regalia. The city was entrusted with the safe-keeping of the Holy Lance that pierced Christ’s side, a piece of the True Cross, a splinter from the manger, a piece of the tablecloth used at the Last Supper, part of the apron worn by Christ while wiping the Apostles’ feet, the tooth of St. John the Baptist, the arm bone of St. Anne, a portion of St. John the Evangelist’s garment, and the chains that once bound Sts. Peter, Paul, and John the Evangelist. Nuremberg also received the crown of Otto I, the reputed sword of St. Maurice, the scepter and orb, the coronation cloak, stockings, gloves, alba, and dalmatica, and Friedrich II’s sword and scabbard. The myriad objects were housed in the Heilig-Geist-Spital Church, a neutral location, rather than either of the city's parish churches. Not long after the sacred treasure came to Nuremberg, the city council and local religious leaders instituted the feast of the Holy Lance, an annual celebration on the second Friday after Easter. This important church feast attracted crowds of pilgrims to Nuremberg. Taking advantage of the economic—and, of course, spiritual—opportunity, the “ingenious” and “enterprising” Nuremberg government scheduled a large two-week trade fair to coincide with the display of holy relics, ensuring maximum financial profits. On the Thursday following Easter, eight days before the Feast of the Holy Lance, visitors and local residents alike filled the Hauptmarkt (the main market square) to see the relics displayed from the top of the two-storey Heiltumsstuhl, a wooden structure specifically designed for this purpose. As depicted in a print from 1487 (fig. 18), church leaders held the reliquaries aloft for the gathered crowds to admire from below; saying the appropriate prayers in view of the relics granted the faithful indulgences to lessen their time in Purgatory—certainly a compelling reason to visit Nuremberg around Easter. Unquestionably, the three crosses with the prominently displayed Holy Lance reminded audiences viewing the Nuremberg cityscape that the holy relics were kept on the other side of the double-walls. What they may also suggest is the piety of the city and its inhabitants. Like the two parish churches labeled in the skyline, the crosses insist that Nuremberg is especially pious—a concept supported, of course, by the presence of the holy relics. Achim Timmermann adds another layer of meaning to the foreground imagery with his darker analysis of the print. Timmermann describes how late medieval Nuremberg carried out executions, processing the condemned from the Rathaus, across the Hauptmarkt, and through the Frauentor. The criminal, and the townspeople following behind him, passed a stele-like “confessional cross,” or Beichtenmarter, featuring a Crucifixion scene (figs. 19a-b), as well as the three true-to-scale Golgotha crosses, on their way to the ravens’ stone (Rabenstein), a raised platform used for beheadings (fig. 20). Traveling from inside the city to the execution block and past the three crosses symbolizing Golgotha reminded both onlookers and criminals of Christ’s Passion and sacrifice. The “wayside crosses,” what Timmermann terms the many different kinds of crosses and microarchitecture installed along roads and outside cities, provided a dramatic backdrop for the gruesome proceedings and the criminal’s last confession. Catching sight of Christ’s crucifixion or the three wooden crosses might compel the sinner to repent—to ask for God’s forgiveness like the good thief whose soul was saved on the cross moments before he died. Combined with the soothing words of a cleric, the wayside crosses may have calmed criminals and coaxed them into dying “good deaths,” accepting death in a final act of imitatio Christi (imitation of Christ). While the condemned might find it heartening to think of their execution as a reenactment of the Passion, pious citizens watching the proceedings could imagine themselves transported to Golgotha, witnessing the suffering of their Lord, and thus reaffirming their faith. Apparently the Christ-like suffering of criminals before their execution might include amputation, maiming, mutilation, or evisceration; frequently, in Nuremberg, the body parts of criminals were placed on or next to the life-size Golgotha crosses. Thus, the prominent display of the Holy Lance, vinegar-soaked sponge, and leg-breaking clubs would have been keenly understood as instruments of torture—in addition to symbols of holy relics and Christ’s Passion. As Timmerman suggests, wayside crosses were indeed part of the late medieval “topography of justice.” In addition to playing a part in public executions, wayside crosses were also commissioned to mark the location of murders. But they could function as devotional way-markers into cities or as part of the Stations of the Cross—a series of images featuring scenes from Christ’s Passion installed along routes within or through churches or cities. Notably, wayside crosses appear next to roads in the Nuremberg Chronicle’s images of Erfurt, Neissa, and Cracow (figs. 21a-c). Their appearance in these city views testifies to the popularity of such installations. But they also suggest room for a reading of the wayside crosses that is separate from the execution narrative discussed above. What has become clear from analyzing the Golgotha crosses is that these objects could have multiple, simultaneous meanings. Thus, the stele-like so-called “confessional cross” in the foreground of the Nuremberg cityscape may have functioned as a devotional image on non-execution days. Passers-by, like the bearded man or pilgrims traveling to see the holy relics, might stop to pray or meditate on the Christ’s sacrifice. Perhaps citizens visited the stele on their way to pray or meditate at the Golgotha crosses. Notably, not long after the publication of the Chronicle, around 1505, Nuremberg sculptor Adam Kraft was hired to carve a set of seven Stations of the Cross that were then mounted on pillars and placed along the route between Tiergärtnertor inside the city and St. John’s Cemetery outside the Frauentor gate. Perhaps the earlier Crucifixion-topped stele in the Nuremberg cityscape provided a similar locus for devotion. Set off the main road to the right of the Golgotha crosses is the city’s ravens’ stone (Rabenstein), a grass-topped platform where criminals were beheaded (fig. 22). To ascend the stage-like structure, one would climb the stairs behind the door in the lower left corner. A nearly identical ravens’ stone and its staircase is visible in the frontispiece of an early printed law code, entitled the Bambergische Halsgerichtsordnung (fig. 23, 1509). The detailed print showcases a variety of torture and execution instruments. Behind a rather macabre flower is a type of wayside cross that Timmermann calls a “poor sinner’s cross.” This cross features the crucified Christ flanked by the Virgin Mary and St. John the Evangelist. Although the scene on the poor sinner’s cross in the Nuremberg cityscape is much smaller, it, too, is clearly a Crucifixion panel. Like the Golgotha crosses and the confessional cross discussed above, this poor sinner’s cross may have encouraged repentance. While it is possible that the artists may have included a ravens’ stone in the foreground of the Nuremberg cityscape for “authenticity,” choosing to accurately depict the structures just outside the city walls, it is my opinion that the inclusion of an executioner’s platform deliberately asserts the judicial power of the city’s government. Remarkably, this symbol of law and order appears again over the shoulder of St. John the Baptist as he baptizes Christ with water from the Pegnitz River in a printed city view from 1559 (fig. 24). It would seem that including this symbol of civic justice remained important for representing Nuremberg over sixty years later. In both prints the message is clear: the ravens’ stone is a place where justice has and will continue to be done. By including potent emblems of everyday governance (ravens’ stone) and devotion (wayside crosses) in the foreground of the Nuremberg cityscape, the artists underscored the city’s power and piety. The price of an unbound and uncolored copy of the Nuremberg Chronicle was around 3 guilders; a bound and uncolored copy cost about 5 guilders; and for a bound, hand-colored copy, the going rate was 8 guilders. At a time when a printer’s average yearly salary was 32 guilders, a legal court scribe could make 40 guilders a year, and a physician typically earned 100 guilders annually, a copy of the Nuremberg Chronicle was very expensive, but not prohibitively so. According to these prices it seems that the literate and semi-literate, upper- and upper-middle class men who could afford the Chronicle were from the same class as the men who published it. Consequently, when the civic-minded men responsible for book’s publication created their lasting tribute to the city and anticipated local and international audiences, they probably imagined that their readers would be their counterparts in rival cities. It is, thus, interesting to consider what message the men wished to convey to their business associates and competitors via the Nuremberg cityscape. With its two large parish churches, the most sacred relics in the Holy Roman Empire, and multiple religious installations outside its gates, Nuremberg must be a pious, Christian city. Made of stone and surrounded by double-walls and countless towers, Nuremberg must be safe from fire and invaders. If residents or visitors fail to follow the laws in this self-governing imperial free city, justice may be deadly. As long as you follow the rules, the gates of Nuremberg are open for your business, and you, too, can enjoy the city’s grandeur. Füssel, Stephan and Hartmann Schedel. Chronicle of the World: the Complete and Annotated Nuremberg Chronicle. Köln; New York: Taschen, 2001. Green, Jonathan. “Text, Culture, and Print-Media in Early Modern Translation: Notes on the Nuremberg Chronicle (1493).” Fifteenth-Century Studies 33 (2008): 114-132. Leitch, Stephanie. “Center the Self: Mapping the Nuremberg Chronicle and the Limits of the World.” In Mapping Ethnography in Early Modern Germany: New Worlds in Print Culture, 17-35. Basingstoke; New York: Palgrave Macmillan, 2010. Maué, Hermann. “Nuremberg’s Cityscapes and Architecture.” In Gothic Renaissance Art in Nuremberg, 1300-1550 (exh. cat. ), 27-50. New York: Metropolitan Museum of Art; Nuremberg: Germanisches Nationalmuseum; Munich: Prestel-Verlag, 1986. Rücker, Elisabeth. Hartmann Schedels Weltchronik: das grösste Buchunternehmen der Durer-Zeit. Munich: Prestel, 1988. Schmauch, Walter W. and Kosta Hadavas, trans. First English Edition of the Nuremberg Chronicle. Madison, Wisconsin: University of Wisconsin Digital Collections Center, 2010. Accessed April 2015. http://digicoll.library.wisc.edu/cgi/t/text/text-idx?c=nur;cc=nur;view=toc;idno=nur.001.0004. Smith, Jeffrey Chipps. “Imaging and Imagining Nuremberg.” In Topographies of the Early Modern City, edited by Arthur Groos, Hans-Jochen Schiewer, and Markus Stock, 17-41. Göttingen: V&R Unipress, 2008. Smith, Jeffrey Chipps. “Pride of Place: Art in the Cities.” In The Northern Renaissance, 67-92. New York: Phaidon Press, 2004. Smith, Jeffrey Chipps. Nuremberg, a Renaissance City, 1500-1618. Austin: University of Texas Press, 1983. Timmermann, Achim. “Highways to Heaven (and Hell): Wayside Crosses and the Making of Late Medieval Landscape.” In The Authority of the Word: Reflecting on Image and Text in Northern Europe, 1400-1700, edited by Celeste Brusati, Karl A. E. Enenkel, and Walter S. Melion, 385-441. Leiden; Boston: Brill, 2012. Timmermann, Achim. “The Poor Sinners’ Cross and the Pillory: Late Medieval Microarchitecture and Liturgies of Criminal Punishment.” Umeni vol. 55/5 (2007): 362-373.